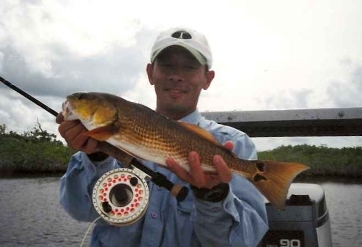 Depending on the time of year, tides and weather conditions, there are a few options for fly fishing for redfish in the Everglades backcountry. The fishing is casting to shorelines on the mangrove roots. I run from spot to spot looking for points of islands and for good current flow. Clouser type flies rule here or flies that are weighted on intermediate sinking lines or sink tips. Look for big downed trees with oyster growth or white spots on the bottom where trees are laying. Cast and let the fly settle with a healthy weed guard and strip it out. A trolling motor will help in windy conditions. I love this kind of fishing since you never know what you will hook. Its chuck and duck fishing and all fun, the redfish are very dark colored and fight good, diving for structure. Sight fishing for Reds out back isn't done by too many anglers which makes it awesome. You will have it to yourself. Look for small lakes and flats with tidal flow, pole southern facing shorelines when it’s cold. These fish eat flies eagerly and snook will be seen too. 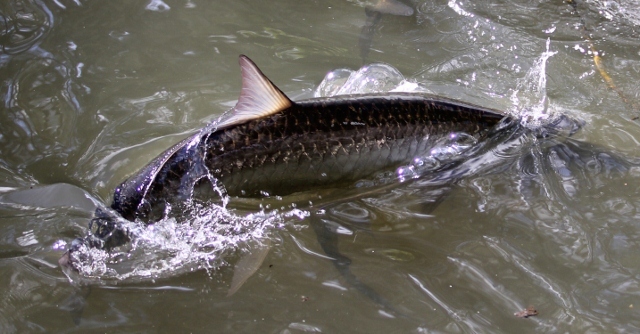 Tailers can be common at times on large flats all over the Glades. I like the outgoing tide here to expose them, and mullet patterns get the nod. Full sun is a must in this brown water to see them and shallow, still coves are a good starting point when it’s cold. Look 20 ft from the shoreline and not on the shoreline in colder water, especially if you “blow fish up” (you see "boiling mud" coming off the bottom) in the deeper water. Again mullet patterns are my go to here and divers/poppers can get a strike also. If you want peaceful and tranquil fishing, this is the pinnacle of redfishing. Leaders: 20-30lb shock tippet 9ft long. Lines: floating and sink-tips and intermediates for dredging. Flies: mullet patterns in white/yellow, crab patterns in dark brown, clousers in white/brown weighted eyes and spoon flies. 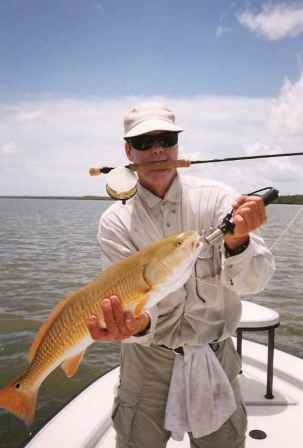 To read about Redfish in Fla. Bay, Click here or to return to Home page click here.